It's an understatement to say that I "like" trikes. I'm fond of them! 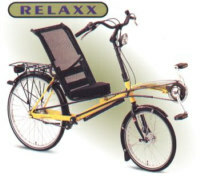 There are so many different models of trikes: there are "tadpoles" with one rear and two front wheels, there are "deltas", with two wheels in the back, and there are sidecars, where the third wheel is not on its own axle. 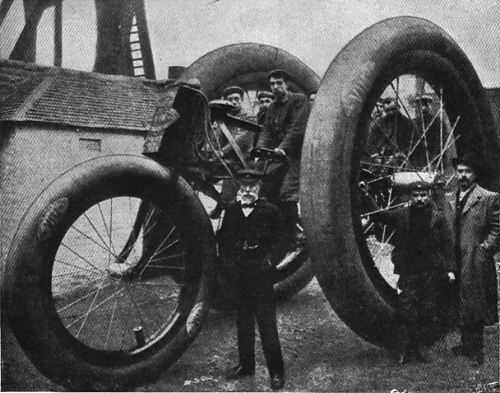 There are small trikes, large trikes, streamlined trikes, delivery trikes ("triporteurs" in French) and even steam driven trikes, like the monster above. Okay, okay, that one is a bit over the top, but in the early years of motorized transport, people were at least inventive and not just copying each others ideas! Stability can be an issue with trikes: three wheels are more vulnerable to turning over than four-wheelers. When it comes to speed, tadpoles seem to be more stable than deltas. So for me it's quite obvious that if I want to have a trike, it would be a tadpole, since I simply can't take afford to break by spine... again. In a standard bicycle frame, the SACHS engine is capable of running 1.2 liters/100 km, that is nearly 200 MPG, yes: two hundred miles per gallon ! In a trike, of course, the mileage should be even better, since there is less drag, and it would be easy to streamline it with some kind of fairing. The creation of this trike has been put on "hold", since my health (and wealth) went downhill and I had CABG-surgery.